Kids' Custom Painted Wood Wall Letters - Personalize a kid's room with our custom painted wood wall letters. You can customize this design to match your child's room colors, or request a completely original design. If your kids can dream it, our talented artist can custom paint it on their wood wall letters. We can match kids' bedding, wall art, and wall color. For the best match, you can s end us fabric swatches, paint samples, or photos. Kids love to see their name, and these quality wood wall letters are a beautiful way to display it. Each letter is custom painted with top quality paints and sealed with a non-toxic, non-yellowing varnish to ensure that your wood wall letters will last for years to come. Enter custom requests in Shopping Cart. Full Description Kids' Custom Painted Wood Wall Letters - Personalize a kid's room with our custom painted wood wall letters. 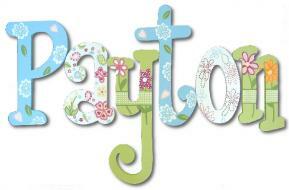 You can customize this design to match your child's room colors, or request a completely original design. If your kids can dream it, our talented artist can custom paint it on their wood wall letters. We can match kids' bedding, wall art, and wall color. For the best match, you can s end us fabric swatches, paint samples, or photos. Kids love to see their name, and these quality wood wall letters are a beautiful way to display it. Each letter is custom painted with top quality paints and sealed with a non-toxic, non-yellowing varnish to ensure that your wood wall letters will last for years to come.